A Hong Kong shopping mall received an unusual visit on Sunday, when a wild boar wandered in and got trapped in a ceiling at a children's clothing store. The female pig spent four hours evading animal control officers at the Chai Wan shopping mall before she was finally tranquilized and taken to an animal management center for observation, the South China Morning Post reported. 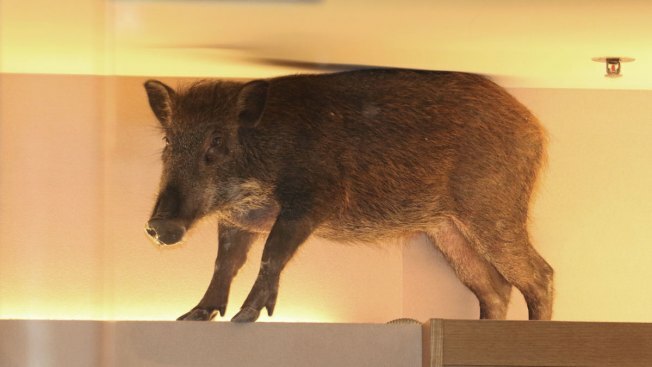 A crowd of shoppers watched from behind a line of police and squealed as the boar broke through the ceiling, landed on top of display cases and later jumped to the floor, running around the shop. Before the ordeal was over, the animal managed to bite a mannequin, according to the Post. Prince Harry Would "Love to Have Kids Right Now"